« What they did mattered then, and what we do matters now. April 15, 2010. Matthew Rozell and survivor Steve Barry honored before 121 liberators in Washington, DC just before Rotunda ceremony on April 16th. More than 100 former U.S. soldiers who liberated Nazi death camps during World War II were honored this week in Washington, D.C. The veterans recalled the horrors they witnessed 65 years ago when they encountered the victims of the Holocaust. The flags of their wartime divisions lined the U.S. Capitol rotunda for the ceremony to honor the old soldiers. And Army General David Petraeus paid them a tribute. “Just as the horrors of the death camps will never be forgotten, neither will your courage, selflessness, or compassion,” he said. These men, known as “The Liberators”, were among the first witnesses of one of the greatest horrors of the 20th century, the concentration camps where six million Jews were systematically slaughtered. Much of what they did is commemorated at the U.S. Holocaust Memorial Museum in Washington. They toured the museum before the ceremony. 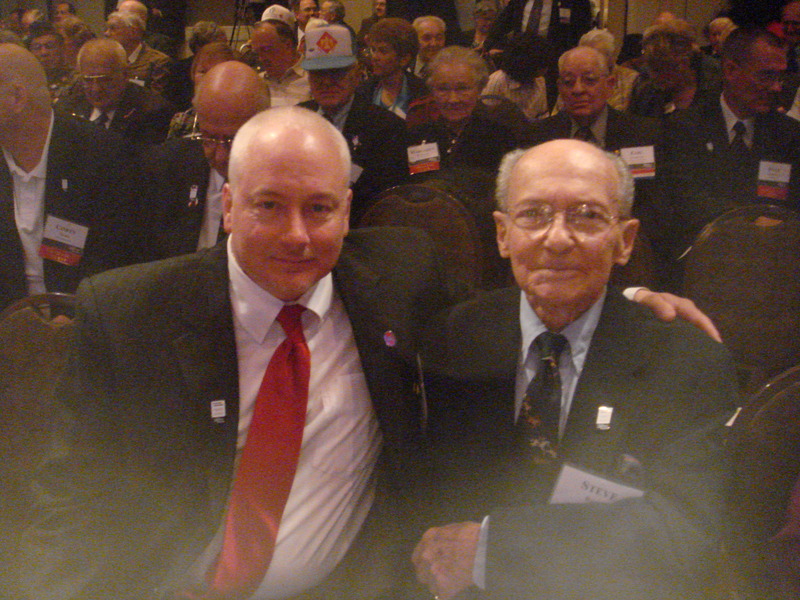 One of the liberators, George Sherman, 84, was a young Jewish soldier at the time of the war, fighting in the U.S. Army’s 11th Armored Division. In early May 1945, his squadron [???] left Linz in Austria on its way east to join forces with the Russians. But as Sherman’s reconnaissance unit left the city, they caught wind of something terrible. “Within a kilometer or two of leaving we started to smell an odor which we couldn’t identify which was really strong.” So he and his buddies followed the stench and found stockades with barbed wire and prisoners wandering all over the place. “Inside the gates there were just piles of bodies stacked up and mainly people coming out of what turned out to be their barracks, in the worst physical conditions, skeletons, a lot of the things they were wearing were just rags,” Sherman said. The soldiers of his division were welcomed as heroes at the Mauthausen concentration camp. Sherman’s wife Marcia accompanied him on the museum tour. She says it brought back memories he’s never talked about before. What angers Sherman now is when people try to deny the Holocaust. “How they can in the face of all the evidence, that has been carefully documented and authenticated, how they can deny this? It’s unbelievable,” he said. The Holocaust museum documents the genocide and the testimony of the aging survivors. One of them is Steve Barry, now 85 years old. He was on a train crammed with prisoners and still remembers the day he saw his American liberators. “I don’t think the word has been invented yet, of how I felt,” Barry said. He said he owes those liberators his life. But one he met disagreed. But the liberators did get something here in Washington. Gen. Petreaus honored each with a medal. The aging vets posed for a photo with general at the Holocaust museum, where the flags of their old divisions hang permanently above the entrance hall. The men stood proud, once more, for what they fought for 65 years ago.